You haven’t felt emotion until you have seen a parent cry. Some of you are going to a dark place in your mind, thinking about that condescending jerk from conferences, crying in shame. Although that would definitely engage emotion, that’s not the kind of crying I’m referencing. I have seen firsthand how gratitude interventions transform students—their perspectives, their relationships, and their hopefulness. Gratitude can change lives, and the good news is that weaving it into your classroom is easier than you think. What Is Gratitude and How Does It Benefit Kids? Sure, you and your peeps do a speed round of gratitude on Turkey Day (Speed it up Grandma! My drumstick is chilling!). But many of us don’t realize that deep gratitude is experienced in two steps, according to the research of Robert Emmons, a gratitude guru. This is the level that most of us rock on Thanksgiving. It’s the moment when we think, “I’m thankful for ______.” These moments can occur organically or intentionally. Even if we stop at this step, there are benefits. By triggering our brain to look for good things, we begin building a habit of noticing good things more often. Imagine if our students walked into our classroom looking to have a beneficial experience. Imagine if we noticed more of the good in our students and our colleagues. Although there are benefits to this step alone, we can go deeper. The deeper power of gratitude is felt at this step. This is when we reflect on the good thing as an extension of something or someone else’s actions. We don’t even have to have met this person. For example, when I feel grateful for my glazed donut, I can recognize that some masterful donut technician lent his or her gifts to this moment of supreme sugar showmanship. What makes this second step powerful is that it connects us with others, building stronger relationships and increasing empathy. Gratitude is not just appreciation; it’s also connection. You’ve heard of this one. Various studies have shown that when people reflect daily on gratitudes for a few weeks, they increase their well-being—even months later. Doing this in a classroom is quick and easy with a little modeling to students. f) Foods that make your heart smile. A) I have students close their eyes and guide them through a brief visualization in which they imagine a person who has had a major influence on them. Reflect on memories and moments this person provided. B) I have them draft a letter as though they were talking to this person directly. I challenge them to fill an entire page or more, describing memories and lessons learned. Let them know that, although standard grammar and spelling is great, the point of this writing is to share authentic emotions. C) For older students, I usually have them watch Soul Pancake’s video on gratitude letters. If you don’t find the video appropriate for your class, share an example of a time when you told someone how grateful you are for them. By the end of the share or video, students will wonder if they are going to be asked to do the same. Yes. D) Challenge students to share their letter with the person. You can give them low-gradient options, like simply delivering or mailing the letter. They can read it over the phone. Or, to build one heck of a life-changing experience, they can read the letter to the individual in-person. Provide opportunities for them to share what the experience was like. – Designers who created the graphics. You get the idea. Then I challenge students to think of at least twenty total lives who were involved. Afterwards, we debrief the experience and talk about how to do simple versions of this, such as before eating a meal or the next time the hop in a car. Doing so builds habits of seeing how many lives help provide gifts to us. For a lighter version of gratitude, introduce “Let’s toast.” For this activity, have a glass and something metal to tap it with (y’know, like they do at weddings). As students are doing group work or some other activity, clink the glass at a random time. At that cue, any student can randomly stand and give a 10-second toast, such as, “Let’s give a toast to hot dogs. Although we don’t know what they’re made of, they sure are delicious.” At this point, everyone can raise their imaginary glass and toast. Popularized by Capturing Kids’ Hearts, this tradition kicks off class by focusing on good things that we can acknowledge and savor. Have students briefly reflect, pair share, or write down good things that have happened to them recently. Then, take a few shares. Not only will you learn more about your students’ lives, but students will also get opportunities to reflect on and savor things for which they can be grateful. I’ve shared this tradition before, but it’s worth another go: thankful notes. Each Monday, I have students complete at least one “positivity note” or “gratitude note.” They can either hand deliver the notes to a classmate or place it in a box for me to distribute later. Click on Class Positivity Notes for a .pdf copy of the slips I use. 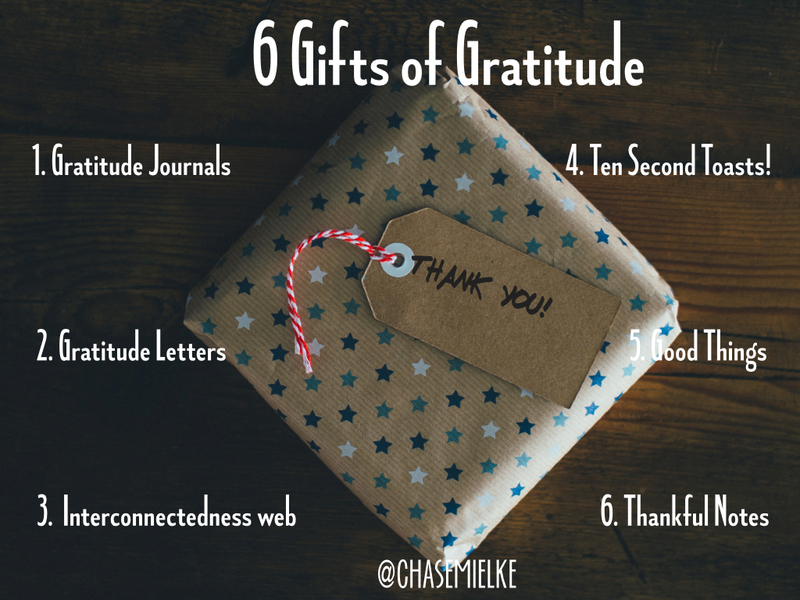 It’s game on for gratitude strategies. Post your experiences and your ideas below in the comments section. We’ll all be grateful for your share. I’m trying the shout outs effective IMMEDIATELY!! Love these.